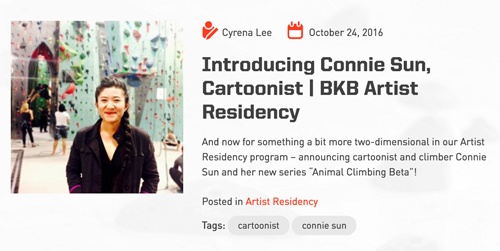 Super excited to be a new cartoonist in residence at Brooklyn Boulders! 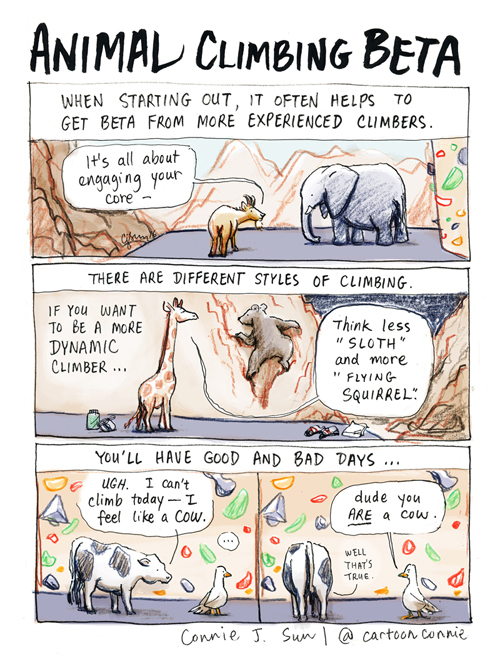 For the next 4 months, I’ll be drawing a series of comic strips on animals and climbing beta! Here's the first one. Stay tuned for future installments! Big thank you to Cyrena Lee and BKB for the awesome oppty and fellow climber Lakshmi Menon for her excellent photog skills. "The community at Brooklyn Boulders has come to mean a lot to me in a short span of time...One of the unexpected gifts of climbing has been the people I have met, who have generously shared wisdom, kindness, and beta with me. On good and bad days, I can always count on climbing as a safe space where I can leave stress and anxiety to the side, off my mind...I didn’t know when I started climbing how much I would feel uplifted by this community, both on and off the wall. I hope you enjoy the cartoons. They are dedicated to YOU: everyone who “climbs” in every sense — reaches high, learns to fall, gets back up again, and finally sends." wow! That is great. Have fun! Great to see the face behind the art! Well done you!